The V-Series represents a high quality power supply series from Cooler Master. The power supplies below offer high performance and at the same time are fully equipped and designed for very low noise emission and maximum reliability. The most interesting feature of these power supplies is their extremely high efficiency - they are 80Plus Gold certified and their specifications even scratch the 80Plus Platinum brand. This offer is limited to 2 items per customer / company. Due to ongoing high level of demand (mining), we have set a limit for the number of items per client. Multiple orders will be cancelled. Thank you for your understanding. A power supply unit (PSU) is the component that supplies power to the other components in a computer. 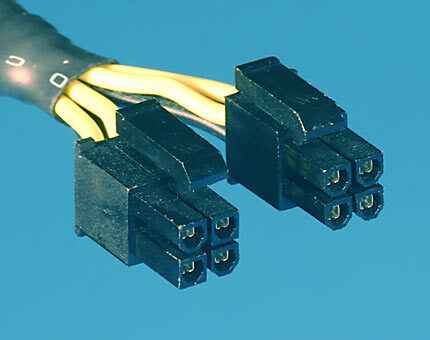 More specifically, a power supply unit is typically designed to convert general-purpose alternating current (AC) electric power from the mains (100-127V in North America, parts of South America, Japan, and Taiwan; 220-240V in most of the rest of the world) to usable low-voltage DC power for the internal components of the computer. Some power supplies have a switch to change between 230 V and 115 V. Other models have automatic sensors that switch input voltage automatically, or are able to accept any voltage between those limits. When cooling is active, the heat energy is removed from the component to be cooled by means of a fan or pump. It is far superior to passive cooling in terms of performance. Over Voltage Protection protects the PC against overly high voltages. To prevent damages to the PC, the power supply turns off when an over voltage is present. "Under Voltage Protection", or UVP for short, is a protective mechanism for output direct current. The power supply automatically switches off if the voltage converted by the power supply falls below a defined threshold. This protects the power supply and hardware components against damage. SCP stands for "Short Circuit Protection" and represents an important protective function for power supplies. If a fault leads to a short circuit in the computer, the SCP function switches off the power supply to prevent additional defects to the hardware. This important protective circuit stands for Over Temperature Protection. Heat is created within the power supply during control actions. It the interior of the power supply becomes overheated, the OTP protects the electronics against damages. Similar to the OCP, the OPP is one of the protective circuits built into the power supply. OPP stands for Over Power Protection. If a power supply is operated at an excessive power level, the OPP protects the power supply against a technical breakdown. Gutes Premium PSU für einen guten Preis! Am PSU kann man so direkt nichts bemängeln, ausser, dass ein wenig "schmürzelig" mit den gelieferten Anschlüssen/Kabeln umgegangen wird. Sehr knapp berechnet. Funktional ein sehr gutes PSU, gemessene Leistungen besser als in der "tech-spec" vom Hersteller.